To investigate the prevalence of cyst formation after using all-inside meniscal repair device and analysed the risk factors associated with it. 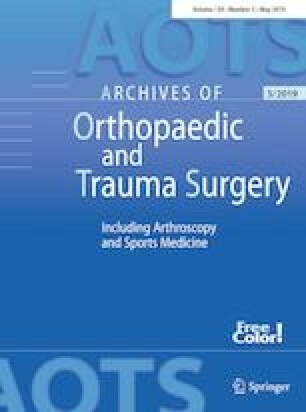 Between August 2008 and September 2013, 51 menisci of 46 patients were included in the study, 46 menisci of which had concomitant anterior cruciate ligament (ACL) ruptures and had an ACL reconstruction. Magnetic resonance imaging (MRI) of the knee was performed at 3, 6, 12 and 24 months after meniscal surgery. The MRIs were assessed to detect the development of cysts encasing the suture anchors and to evaluate meniscal healing. Statistical analysis was performed using multiple regression analysis. Out of the 51 menisci examined, MRI revealed cysts in 15 menisci. Cysts were detected in 3 menisci at 6 months, in 9 menisci at 12 months, and in 3 menisci at 24 months after surgery. Only 3 patients (6.5%) were symptomatic, and cystectomy was performed in 2 of these patients and arthroscopic debridement in the other. Compared with using both the suture device and an inside-out suture repair, using the suture device alone was more likely to be associated with cyst development [odds ratio (OR), 12.04]. The medial meniscus was also significantly more likely to develop a cyst compared with the lateral meniscus (OR, 12.48). There was an increased outcome for the number of device use (P = 0.033). Though it was not statistically significant, the patients with anterior knee laxity (side-to-side difference > 3 mm using a knee arthrometer) were more likely to develop cysts than those without anterior knee laxity (P = 0.06). There were no significant differences between the remaining variables. The prevalence of cyst formation around the suture implant was 29%, but most cases were not symptomatic. Significant risk factors for cyst formation included the use of a suture device alone, and a location in the medial meniscus. We thank Junsei Takigami M.D., Ph.D. from Shimada Hospital and Kazuya Nishino M.D. from Osaka City University for their technical support and data analysis. No authors declare any conflicts of interest relating to the submitted paper.